Who hasn't dreamed, on a mundane Monday or frowzy Friday, of chucking it all in and packing off to the south of France? Proven?al cookbooks and guidebooks entice with provocatively fresh salads and azure skies, but is it really all C?tes-du-Rh?ne and fleur-de-lis? 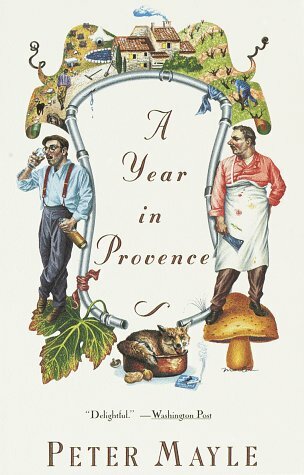 Author Peter Mayle answers that question with wit, warmth, and wicked candor in A Year in Provence, the chronicle of his own foray into Proven?al domesticity. Beginning, appropriately enough, on New Year's Day with a divine luncheon in a quaint restaurant, Mayle sets the scene and pits his British sensibilities against it. "We had talked about it during the long gray winters and the damp green summers," he writes, "looked with an addict's longing at photographs of village markets and vineyards, dreamed of being woken up by the sun slanting through the bedroom window." He describes in loving detail the charming, 200-year-old farmhouse at the base of the Lub¨¦ron Mountains, its thick stone walls and well-tended vines, its wine cave and wells, its shade trees and swimming pool--its lack of central heating. Indeed, not 10 pages into the book, reality comes crashing into conflict with the idyll when the Mistral, that frigid wind that ravages the Rh?ne valley in winter, cracks the pipes, rips tiles from the roof, and tears a window from its hinges. And that's just January. A funny--and often hilarious--month-by-month account of the charms and frustrations of moving into an old French farmhouse in Provence and adapting to a very different way of life. This book was a wonderful read. Funny, light, somewhat educational. Easy to read. Descriptive to the point that I felt I was there. Great Armchair Travel to Provence! A Little Piece of France at Your Fingertips. Delicious reading, creme brulee for your head! I read this book as a follow up to "Almost French" which I thoroughly enjoyed. I wanted more but that author hadn't written anything else (yet?) so I looked to the back cover where there were some recommendations. I am so glad I did! I read this book years ago, along with it's 2 sequels, this being my favorite of 3. I've also often given it as a gift to friends preparing to go anywhere in France, and they've loved the humor of it / a taste of France / the French. I wonder what he would write about Indiana? I started the Provence trilogy by reading the last one first-no matter,I will probably read them again because they are so good and redolent [maybe too strong a word] of humanity. I read books slowly and the predominant thought that I always dealt with at the time, regardless of how much of it had passed since last I picked up the book, was the extraordinary humanness of his writing. The book oozes with deep, deep love for the people, their culture and the land that surrounds them-even the animals that accompany their passage through this life in the Luberon. The second thought that always occupied my mind as I read Peter Mayle is one of total envy-how can a person be so observant and at the sme time express those observations so lovingly and so clearly. To someone who has not read the book, realize that it is a series of anecdotes about the people that become part of his life in Provence. These people, perhaps naturally or perhaps through Mayle's superb writing, take on a larger than ordinary life. He paints them with the utmost care and love but they emerge from his canvas as more interesting, more substantive and more full of life than most of us can manage-hence the title of this comment. Englishman Peter Mayle and his wife realize what most of us could only dream about--life in the French countryside of Provence. Food and the hearty French life are the themes that run through this book as the Mayles undertake renovating their 200 year old farmhouse. Season by season, Mayle infuses the local folk with wit and character, introducing the eccentric Massot who it seems is forever trying to sell his house to someone, Monsieur Menicucci the local plumber who plays clarinet to keep his fingers nimble during the cold season, stonemason Pierrot who lays stone floors as well as making tombstones, and a good array of other fascinating individuals. Discover how Mayle and his wife became the proprieters of a vineyard virtually overnight (weren't things supposed to take forever in Provence, Mayle thinks??? ), and how to properly prepare a meal of...Fox! warm and funny - feels like a holiday in Provence! Recently, feeling a little tired and overworked, I decided to re-read Peter Mayle. I started at the beginning - with "A Year in Provence". When I read it for the first time, several years ago, I lived in Switzerland and read it rather as a companion to my frequent trips to France. Now I haven't been to Europe for a long time, so I needed to charge my batteries. I can recommend Mayle's books as a great remedy for any kind of boredom with everyday life and lack of vacation! Mayle's book energizes in an amazing way. From the first chapters (the book is divided into months), although it started in unusually cold January, I felt like I were in Provence, breathing the fresh air smelling of herbs and lavender, lived in an old, stone house among the vines and at the feel of the Luberon mountains, and ate good food. Inevitably, food, as a great part of the French experience, is an important subject in this book. Foie gras, wild mushrooms, truffles, wine, all kinds of game, restaurants from home-style ones serving fixed dinners and run by elderly couples, to the most elegant, with multi-course menus and champagne. I could read only about the food forever (luckily, Peter Mayle wrote more books about his life in Provence). Mayle's gentle, but unfailing English sense of humor and his style make this book a lot less banal than it could be, considering the light subject. His masterful character creations, rendering his French neighbors and friends with accuracy, but also with almost loving tenderness (I am sure that even the people shown most critically and in the most funny way, like the grumpy farmer Massot, could not be offended by these descriptions), are superb.